Your choice of commemorative state quarter is transformed into an elegant silver-plated pendant. You can always wear your favorite place close to your heart with these extraordinary pendants. 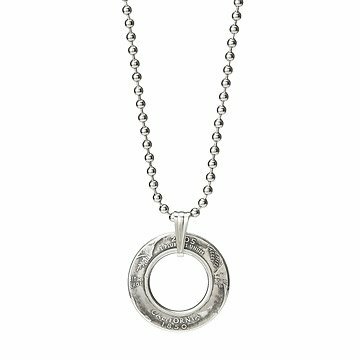 The artist begins with your choice of commemorative state quarter, cuts out a center circle, and then literally turns the remaining metal inside out—the ridged edge of the quarter appears on the inner circle of the pendant. This unexpected twist allows the coins text to display right-side-up, with the state name and year of statehood at the bottom, while the phrase "E pluribus unum" appears at the top. The quarter is silver plated for additional luster, and is suspended from a stainless steel ball chain. Handmade in Mountain View, California. if necessary, polish with a soft cloth. please note that this will make the oxidation process lighter. Looks a lot better online, looks very cheap in person. Disappointment to say the least. High praise from a man of few words. This was a birthday gift for my son. When it arrived he wrote to thank me and said "I love it". This is very high praise from a man of few words.